There is nothing quite like having your very own stuff around even when you travel – such as your own iron, kettle, and what’s this? 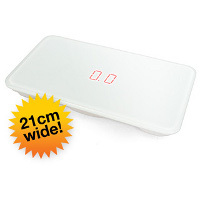 A portable body scale? Yes, not all hotel rooms will come equipped with a scale so that you can keep track of your weight, so why not follow the scouts and be prepared by carrying around your very own £24.99 Portable Body Scale? After all, it isn’t to say that this particular device is heavy, measuring a mere 21cm in length. Made out of toughened glass (hmmm, is it Gorilla Glass here? ), these scales are able to actually support a weight of up to 330lb (150kg). There are no switches for you to fiddle around with – all you need to do is just step on it, and they will turn on automatically, flashing up your weight on the central red LED display. Now you can even stash a scale down your handbag, now how about that? What are some of the other stuff that you would like to see fit into a handbag in the future? To make sure it keeps folks who can’t figure out how many pounds equal to a kilogram, fret not – this puppy will be able to switch between the two for easy interpretation.